Your food service establishment deserves the best protection against costly and destructive pests. Customized service programs to meet the specific needs of your establishment, creating a pest free environment. Thorough inspections at every visit, including sanitation and structural recommendations focused on prevention. Extensive experience with food pests and treatment programs including rodents, cockroaches, small and large flies, and ants. Standard Operating Procedures that set the standard for pest control and ensure a pest free zone. No restauranteur wants to hear they have cockroaches. 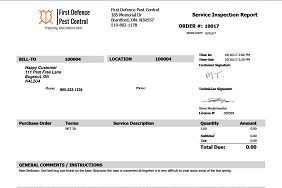 Our programs are designed to monitor for and quickly knock down any pest that threatens your name. Cockroaches have to be dealt with quickly and effectively. Large or small flies pose a threat and create a nuisance for your establishment. We utilize targeted treatments inside and out designed to kill all stages of development. Mice and rats are very destructive and threaten the health of staff and customers. Our outside-in approach ensures that rodents do not become a problem. Ants, occasional invaders, wasps and hornets are attracted to your excellent food. Keep them out with our Defence Protect targeted treatments. Detailed digital reporting. Each visit is concluded with a report of what was done, how it was done, and any concerns for present or future pest related conditions. Detailed log book kept on site to ensure accurate record keeping. Access 24/7 to your personalized portal. 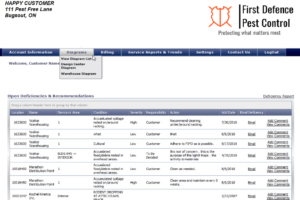 Lookup reports, upcoming service dates, site specific diagrams, trending and more.